Whenever someone expresses a measure of scepticism about the future of SEO, all it takes is one look at the thriving market for SEO tools and software to prove otherwise. From complete SEO suites to niche software like rank trackers and link analysers, SEO software is a booming business as demand for high quality SEO services continues to grow. 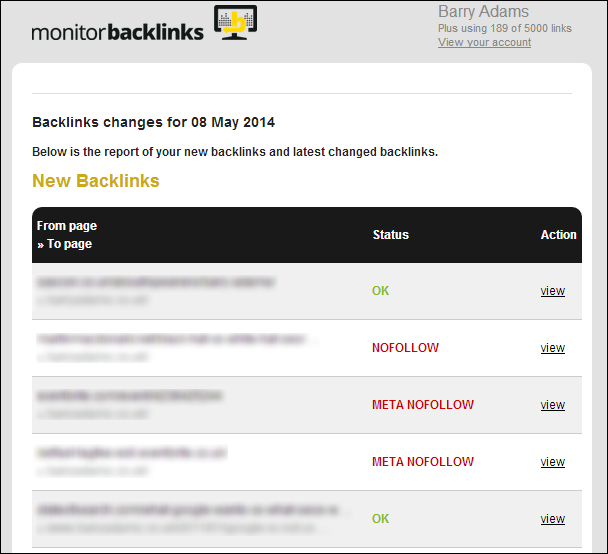 At its heart Monitor Backlinks allows you to keep an eye on your site’s backlink profile. Enter a domain name and Monitor Backlinks will notify you of any new links it finds that point to your domain. You will get a daily email with the new links that have been discovered, as well as notifications when a previously discovered link changes status. 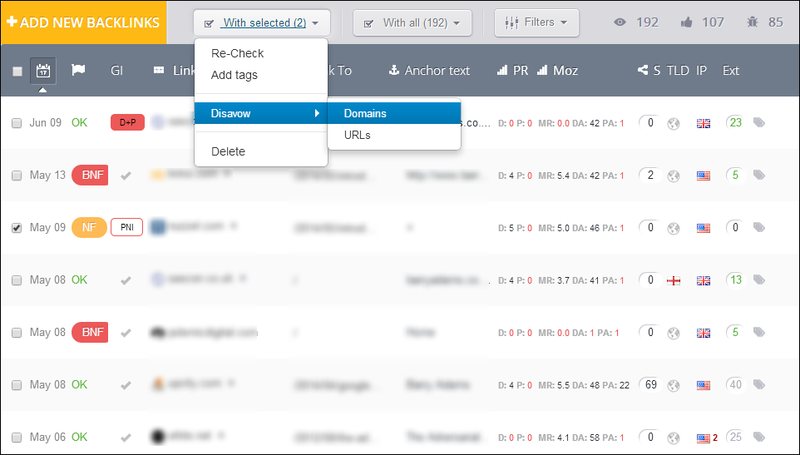 The tool also allows you to add links to a Disavow file, enabling you to keep your site’s link profile clean in nearly real-time. In this day and age of negative SEO, this is a very handy feature set that allows you to keep a close eye on your site’s link profile and ensure you’re not soliciting the wrath of the Google gods to come down on your website as the result of spammy links. Monitor Backlinks also provides a robust set of analytics of a site’s full link profile. It will list all links it has found, complete with a number of useful attributes such as whether it’s nofollowed, if the linking page is included in Google’s index, the page’s & domain’s PageRank and Moz metrics, social shares, and more. It also shows you the anchor text distribution of these links. In addition to the links Monitor Backlinks discovers on its own using Ahrefs data and referrals reported in Google Analytics, it also allows you to import additional links from other sources such as Majestic SEO and Google Webmaster Tools. This is a great feature because, while Ahrefs data is pretty good, it’s not quite as thorough as MajesticSEO, and we all know how Google tends to show a rather ‘unique’ set of links in Webmaster Tools. The ability to import links from these and other sources, combined with Monitor Backlinks’ great UX and ability to create a disavow file very easily, makes this link analysis suite a rather lovely piece of kit. 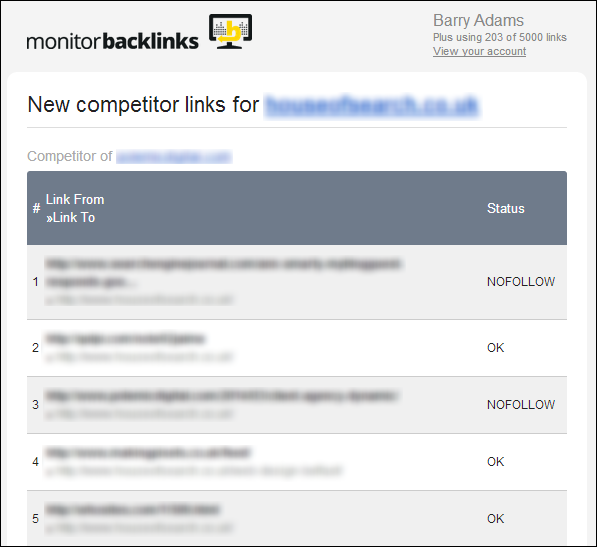 There are a few other handy features offered by Monitor Backlinks, of which my favourite was ability to monitor new links on your competitors’ websites. As with your own domain, Monitor Backlinks will send you daily email summaries of the new links to your competitor websites it has found. This superbly useful feature gives you daily insight in to what your key competitors are doing to acquire new links, enabling you to copy their tactics or, if you’re feeling particularly devious, even actively undermine their linkbuilding efforts. These keyword rankings also have a competitive comparison element, where you see how to stack up against your closest rivals. I can definitely see these graphs making it in to client reports. There are a few more bits and bobs included in the full set of tools, and I suspect the people behind Monitor Backlinks are working hard to add even more features to it. Considering the rich feature set, great user interface, and low price point – starting at $19.90/month, with a free 30-day trial on offer – I can definitely see Monitor Backlinks as good value for money. My only concern is that the features that make Monitor Backlinks such a potent platform will eventually find their way in to other SEO tools like LinkRisk. In the meantime however, Monitor Backlinks adds a certain touch of class to the SEO tool pantheon, and I for one are very likely to keep using it for the foreseeable future. Thanks for reviewing this Barry. Do you know where their link data comes from? The APIs of established tools or their own systems? Hi Sam. Like I say in the review, Monitor Backlinks uses data from Ahrefs, but allows you to upload files with link data from Majestic and OSE. Conveniently skimmed over that part! Do you need an ahrefs account or is that data included in the price of the tool? The Ahrefs data is included in the price of Monitor Backlinks. If you want to import data from Majestic & OSE you’ll of course need separate accounts for those tools. Hi Barry, great review. Been considering which tool to use for link monitoring for a while (way overdue) but this looks like the winner. I hope you’re on commission! Hey can I connect monitorbacklinks through google analytics ? @sohozlife:disqus it’s safe. You can connect/disconnect any time. As the CEO of Monitor Backlinks, I can tell you we have tens of thousands of users that connected their Analytics. If you have any questions or issues, you can send me an email.